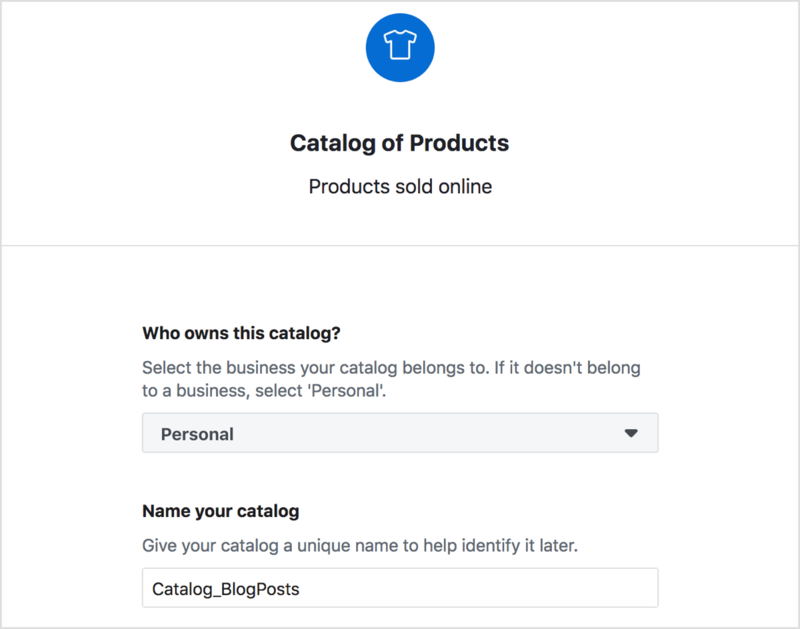 Next, click the Create Catalog button. Then choose the E-commerce option and click Next. From the drop-down menu, choose the owner of the product catalogue. If it doesn’t belong to a business, select Personal. Then enter a descriptive name for it and click Create. On the next screen, click View Catalog. Now you’re prompted to add products. Click the Add Products button. 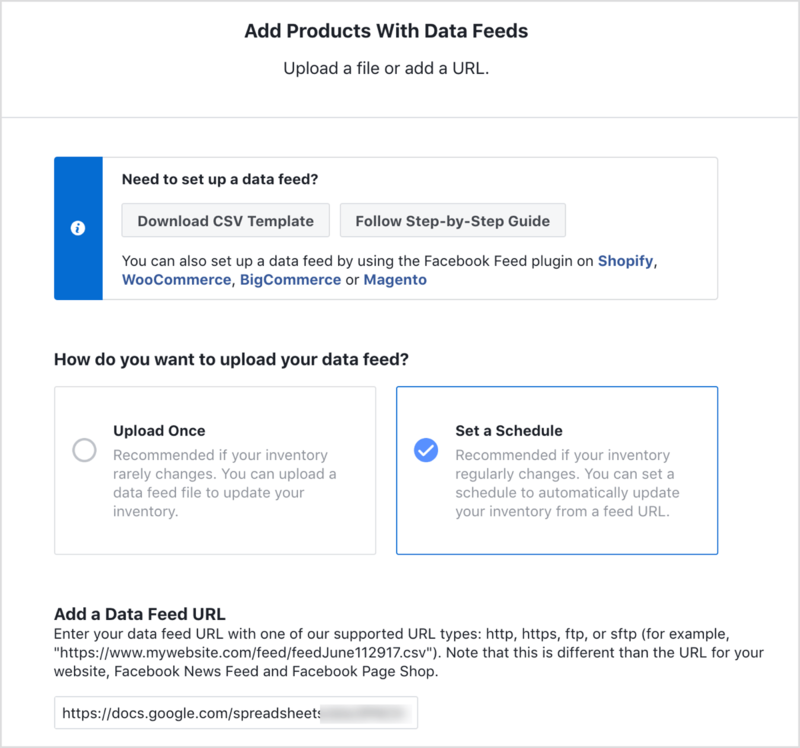 Use Data Feeds: Use this option if you have a product feed (which you just set up). Add Manually: This option is ideal if you have a small number of articles. Connect Facebook Pixels: This is a great way to create a catalogue if you have a lot of articles. When someone reads an article, the pixel fires and that article is added to your catalogue. This requires microdata tags implementation. For this example, choose Use Data Feeds and click Next. Now choose the Set a Schedule option so if you need to add any more articles to the feed (your Google sheet), it will be updated automatically. Below that, add the URL of your published Google sheet. (This is the URL you copied earlier when you published your product feed.) Add your credentials if the file is password-protected. Then fill in the rest of the details and click Start Upload. First, open the Diagnostics tab to check for any issues you need to resolve. Also, check the product details on the Products tab. Ensure that the products are as specified in the feed (price, image, etc.) and make changes if necessary. 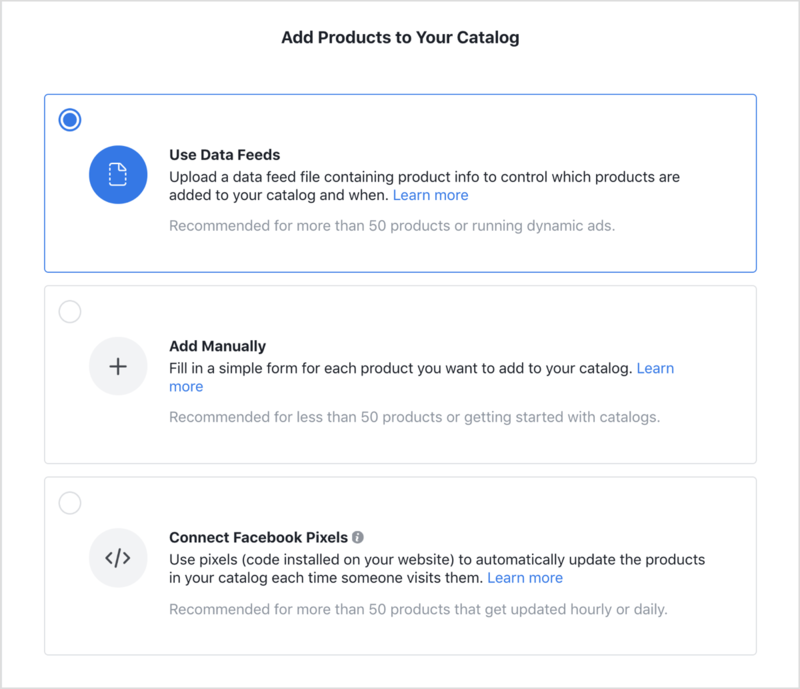 You can also add more products on this tab, as well as delete items from your feed or de-activate them from your campaign delivery. Finally, connect your Facebook pixel to the catalogue. This is important because the pixel will help show more relevant articles to your audience. 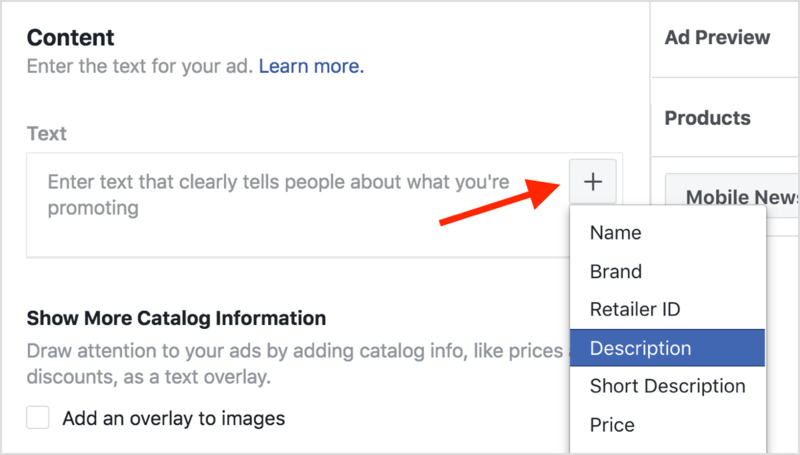 Now you’re ready to set up your Facebook Dynamic Ads. 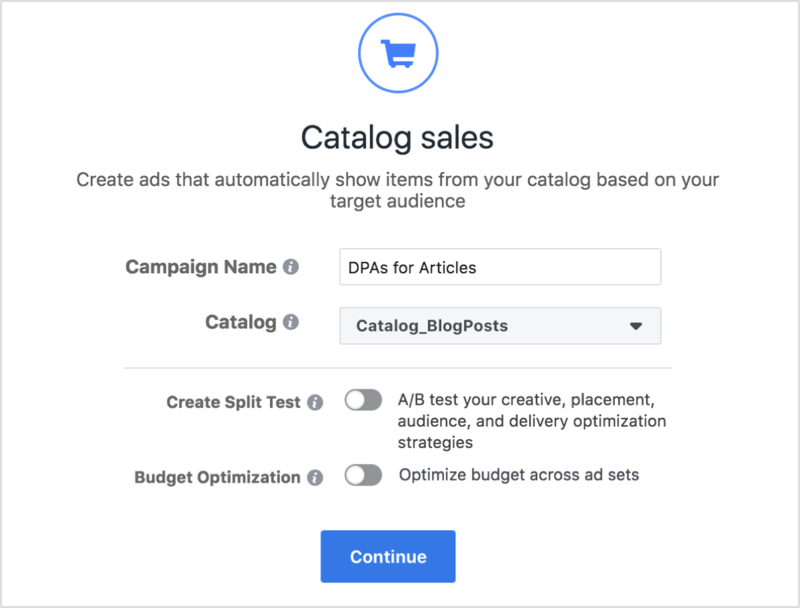 Create a new Facebook campaign in Ads Manager and select Catalogue Sales as your campaign objective. Next, enter a campaign name, select your catalogue, and click Continue. 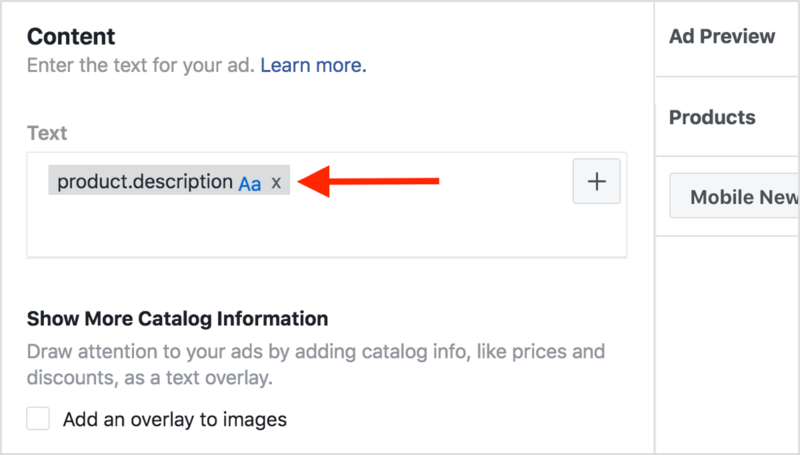 Now move on to the ad set level and make sure all of the products in your product catalogue are chosen to be displayed in your ads. 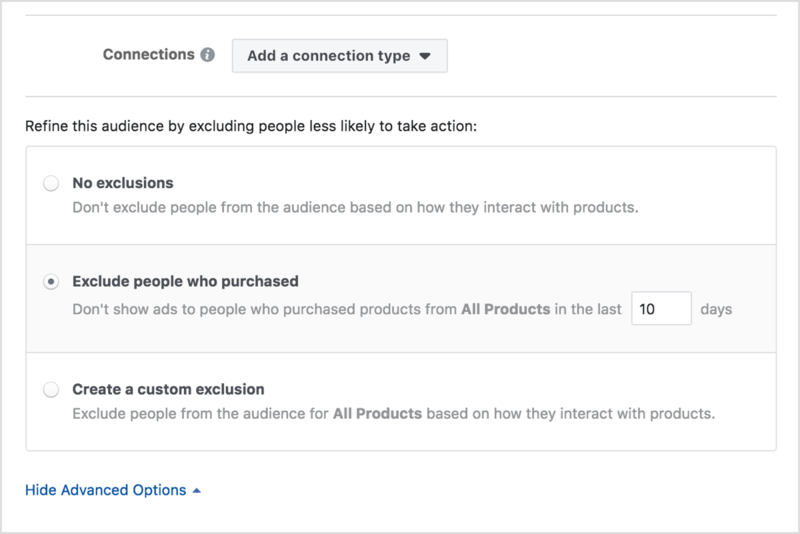 In the Audience section, choose “Define a Broad Audience and Let Facebook Optimize Who Sees Your Products” so you can reach new people and not existing blog visitors. Scroll down below the Connections menu and click Show Advanced Options. You then see options that let you refine your audience to exclude people who are less likely to take action, such as someone who has already visited your blog. Continue with the rest of the ad set creation process as usual. One thing to pay attention to is the optimization event type. 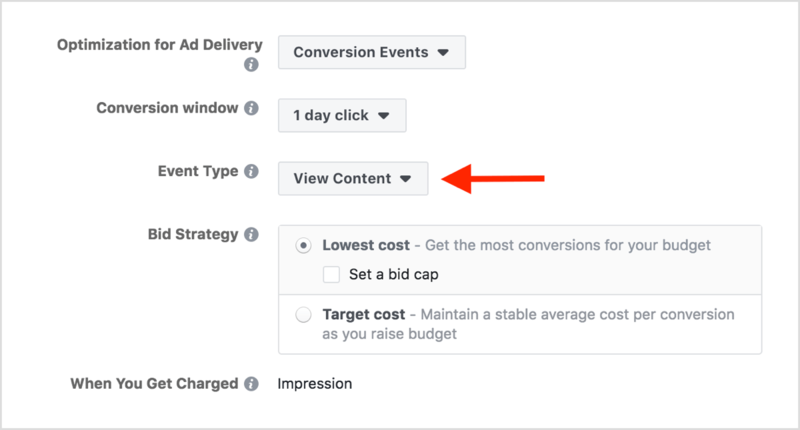 You want to optimize for View Content, the Facebook pixel event you created earlier. Now move to the ad level and choose Single Image as the ad format. If you typically use landscape images in articles, single images will look great. You may need to make some changes if you want to use the carousel format. Next, focus on your ad copy. 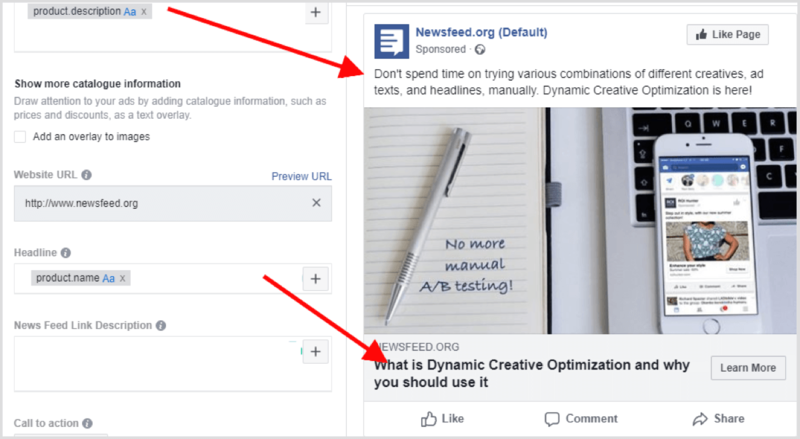 The cool thing about using Facebook dynamic ads for your blog posts is that you don’t have to insert the article name, description, or other particulars. You can click the + button inside each box to pull a catalogue field from the Google sheet you created earlier. For instance, click the + button in the Text field and select Description from the drop-down list. Facebook then adds the product.description tag to the Text field. In the example below, I added the product.description tag to the Text field and the product.name tag to the Headline field. 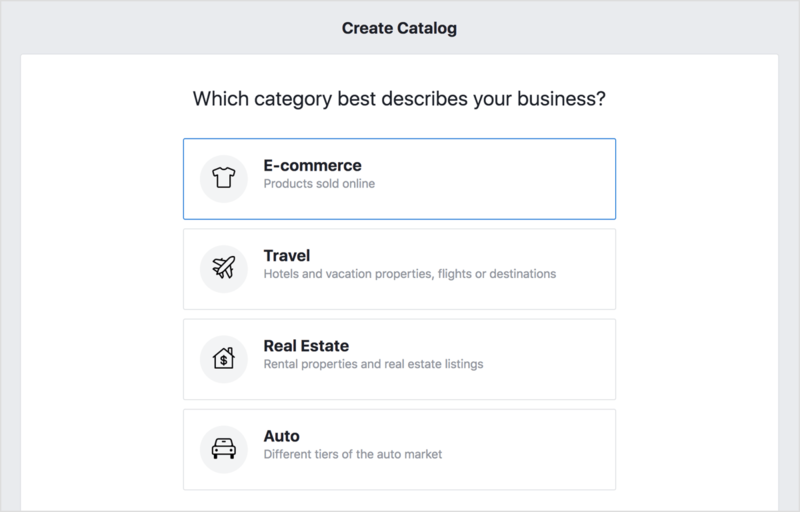 Facebook then pulls the data from the product catalog’s Description and Title fields, respectively. And that’s it! Just click Confirm and you’ve successfully created your dynamic ad. You may think: “But what about the other articles? Shouldn’t I create ads for those, too?” No, you don’t need to. That’s the beauty of Facebook dynamic ads! 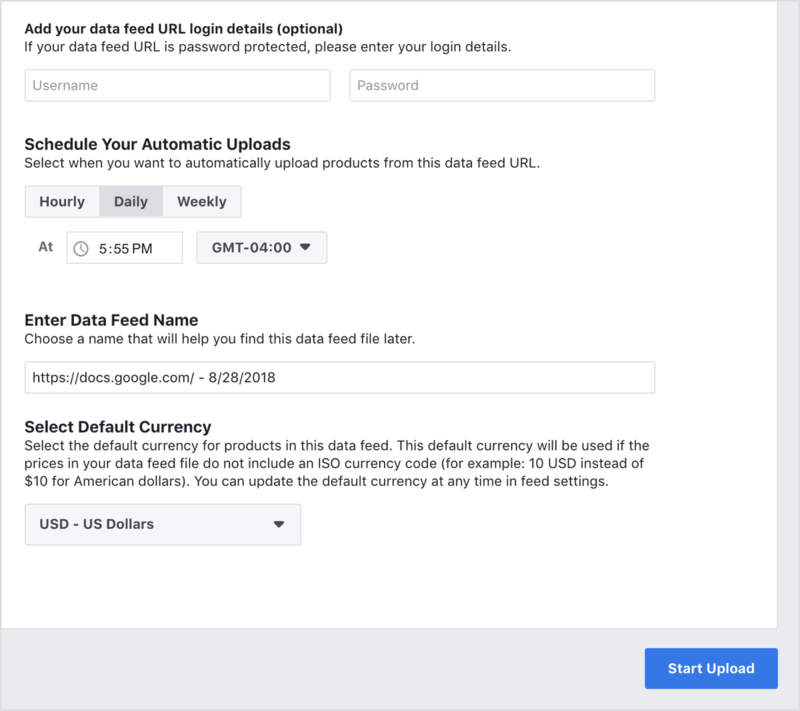 Instead of creating an individual ad for each article, you create an ad template that automatically uses images and details from your data feed for articles you want to promote. Tip: From here, the possibilities are endless. You can create a template to style your images and make them more appealing. 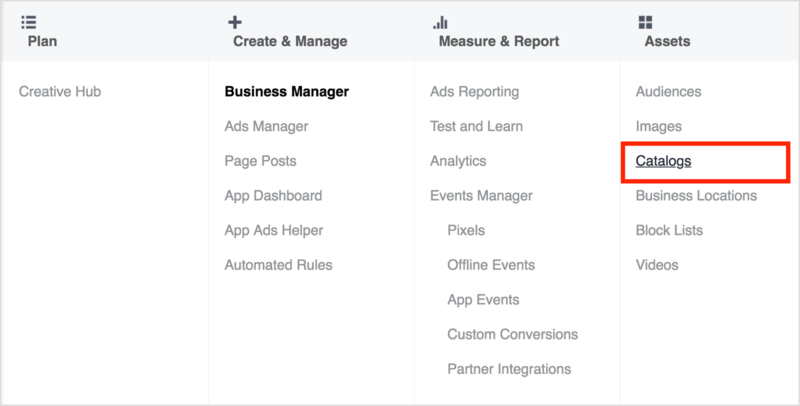 You can also add custom columns to your feed to use in your ads or create new product sets. A version of this article was originally published on Social Media Examiner. In Business Factory, I work as a Facebook Marketing specialist helping both Czech and international clients to enhance their Facebook advertising efforts. 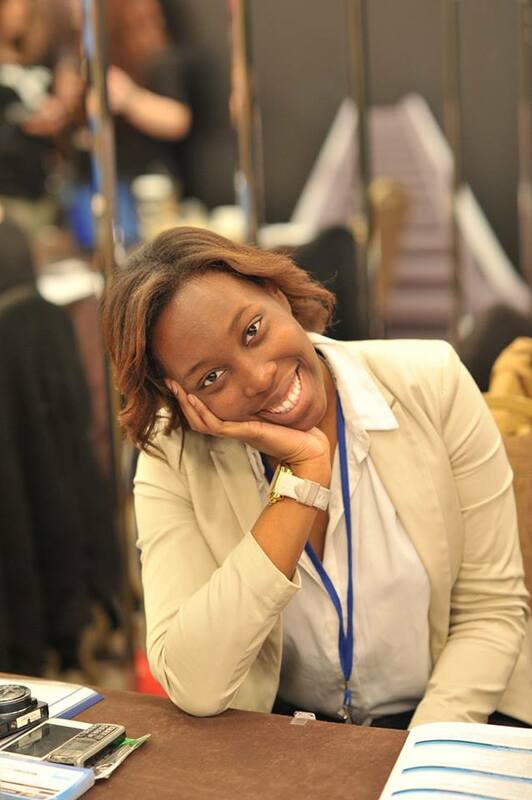 For you, I wear my data-glasses and creative ideas-hat and share with you the tips, suggestions and tutorials that will help you step up your Facebook marketing game.